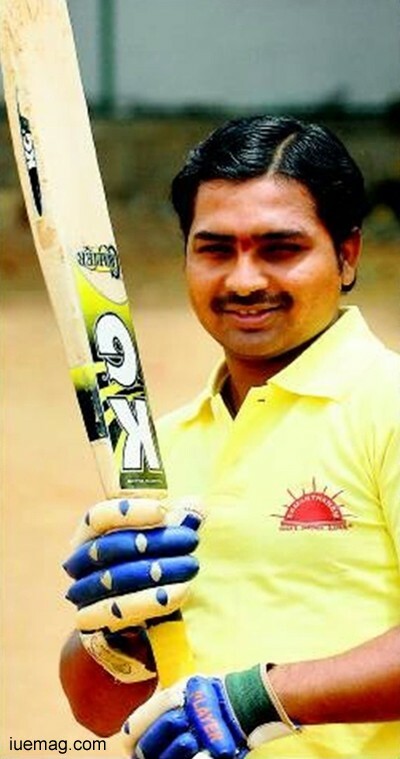 Shekar Naik, the all-rounder, (Indian Blind cricket team captain) was born in 1986 in district Shimoga, Karnataka. He hails from an economically weak and less privileged family. His keen interest in sports was not supported by his community but was often frowned upon. For about 8 years (1986-1994) he suffered from complete blindness. In 1994, accidently he fell into a canal and the very next day the eye check-up camp brought him to Bangalore where later he was operated. Blindness can be observed as a genetically transferred feature in his family as his grandmother suffered from the similar disorder. In 1996 he was enrolled in a blind school, "Shri sharadha devi", Shimoga where he started playing cricket. In 1997, he started working towards shaping up his cricket career and later on in 1998 was selected for the "State level tournament". His parents never encouraged his desires towards cricket, his father was very protective of him and his mother never thought beyond his educational achievements. I am totally blind by birth. In 1994, I slipped into a canal and that was indeed a turning point of my life. I feel that the saying "whatever happens, happens for good" got proven right here in my case. Fortunately, at the same time some people had come down from Bangalore for an eye camp in our town. I underwent an eye check-up and got to know from them that I could get back my sight since my retina was in good condition. They advised my mom and me to go to Bangalore to get my eye operated. The operation was successful and my right eye got 60% of vision but nothing could be done for my left eye. Blindness had kind of inflicted my family. My mom and her four sisters were blind as well. My maternal grandfather was also blind. By the time, I could celebrate watching the colourful world around me, there was something shocking waiting for me. Three months after I got my vision, my dad expired. My dad was very protective about me as I was totally blind by birth. He was never ready to send me to either school or hostel. He wanted to protect me all the time by staying with me. There was a blind school in Shimoga (a district in Karnataka, India) by name 'Shri Sharada Devi School for blind'. My mom wanted to enroll me in that school. When I was totally blind, my mom used to take me to a nearby school and make me sit in the classroom and listen. Soon after the school every day, she used to come promptly and take me back home. But it wasn't so useful, as I could hardly grasp anything. After one and half years of my dad's death, she admitted me in that blind school. Though it was too late, I never regretted it. It was in the year 1997, when I was 11 years old I entered my Grade 1. That's the time when I start-ed playing cricket. I played for state level from my school as a wicket keeper. As my mom was blind by birth, she didn't know about cricket. Still, I went to my mom and shared my desire of playing cricket. As we were in a village, there were many kids who were uneducated. They used to make fun my blindness all day long. They never allowed me to play with them. My mom was severely hurt due to all these instances that took place. She told me that she had placed me in a school and had done her duty. Now, it was my responsibility to find a way to live my life. "You said you want to play cricket, you have to achieve something in this field as well" were the words of hers which I can never forget in my life time. Life was challenging, life is challenging and it shall remain the same forever. I accepted the challenge of life and left myself with no option but to win. I thought that I should do something that can make my name reach nationwide. I was 12 years old boy by then and had the capacity to think and take decisions. I was more interested in cricket than studies. Even during my tests/exams, I used to watch cricket. It always stood as my first priority. If I had to go for a tournament, I always used to count the no. of hours, minutes and days that were left for the tournament. I used to even plan my conveyance charges. I used to enjoy every moment with my teammates during these tournaments. I always used to envision my future and had many dreams. I even possessed the confidence to achieve them all. I have always loved cricket and shall keep doing that forever. There was hardly anyone around me who en-couraged this talent of cricket in me. But Yes! I can't forget the training given in our school by our Physical Trainer. He used to stand with a long stick behind while I was batting. The moment I missed shots or played bad, I was beaten black and blue. To escape from his beatings and most importantly for my mom I started working hard and eventually improved my cricket. Cricket used to occupy my thoughts all the time. I played at the state level too. In the year 2000, there was a tournament in Mandya, wherein I scored 136 runs in 46 balls. Thence my confidence started boosting up. That century broke the fear in me and gave a new dimension to my cricket career itself. I got selected for Karnataka team. Then I got a chance to attend a coaching camp for 15 to 20 days. I had never attended one such camp ever before in my life. It was pretty difficult and I started to feel like not playing cricket at all. It was pretty hot and we had to wake up early at 5.30am in the morning. I started motivating myself and told that I have to do it no matter how difficult it was, as it was not just the dream of mine but my mom's as well. Then I got selected for Karnataka team(South Zone), as the opening batsman. In 2000 there was a match in Belgaum in which Karnataka and Kerala teams battled in the finals. That was the first time, when I played in a stadium. I scored 249 runs in a one-day match. As I said before, my mother had asked me to achieve something in the field of cricket. Just 6 months after she had said that, she expired. It was January 2nd, 1998 which was one of the most shocking days of my life and the day which left me alone. My dad expired in the year 1994 i.e. 3 months after I got my sight. I was just 12 years old when my mother expired. I am the only son to my parents. I was totally broken as I had nobody to even console me. Though my mom was blind, she used to go to farms and work to generate income to feed me. My school was 9 kms away from my house. She used to come by walk to my school in order to save money which would otherwise be spent on bus tickets and buy me a packet of biscuits. She used to love me a lot. During April and May, everyone used to go to their home town with their parents but I had none. I used to feel so horribly sad and I used to get very frustrated. I used to hit against the wall in that anger. I was very angry with God because he had snatched away both my parents from me. I had no care-taker at all. I had to take care of myself. At that age it was almost impossible to see life without parents. For some years my uncle used to take me along to his house for 15 days. From my Grade 5, I started spending all my vacation of two months there itself. I used to work in farm fields in those two months of time. I used to earn about Rs.1000(INR) to Rs.1500(INR) and could afford my food and clothing with that for the whole year. In the year 2001, an under-18 cricket tournament happened in Hyderabad. That was another stepping stone of my life, where I got the Man of the series award. This added as an advantage and played a great role in my selection to play for the World cup 2002. I left my school and joined a school founded in 1904 by Maharaja (King) of Mysore (earlier name of Karnataka state) in Mysore(A district in Karnataka, India). In the world cup, I was awarded Man of the match twice against Australia and Srilanka. Indian team wasn't so strong then, so we could reach only the semi-finals. Also cricket was not so popular then. In the year 2003, cricket world cup was going on. Philips ompany promised to take me to South Africa in order to encourage me. They made my passport also. But they didn't take me at all. In 2004, we had been to Pakistan. That was the very first time that our team had been to abroad. We played 5 matches against Pakistan. They won the series. They won 3 matches we won 2. One thing for which I felt happy was that there's a place called Shekhpur near Rawalpindi, where I scored 198Runs against Pakistan. That is my highest international score. In the year 2005, Pakistan had come to India. We had a series in Delhi. There I bagged the Man of the match once again. In 2006 I was the only person from Karnataka team, who got selected to play for Indian team. The very same year I was bestowed with the "Best Batsman", "Man of the series" and three "Man of the match" awards. Later in 2007 in England, I won "Man of the match" award twice. In 2010, I was been chosen as the captain for Indian Cricket team for Blind. 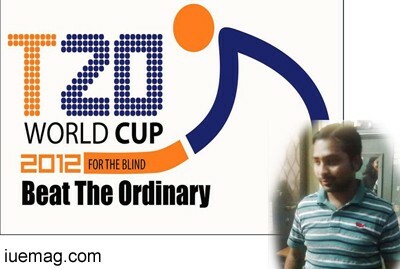 In the year 2012, team Pakistan came down to India for the first ever T20 World cup for the Blind. Totally 9 countries participated then. It was the most memorable moment when the victory surrendered to the passion of our Indian team. If you are seeing me today like this, in this position, it is only because of the support of this noble organisation that is helping ]many under the leadership of this legendary man Mr. Mahantesh G K called "Samarthanam". I joined Smarathanam in the year 2005. Ever since then, Mr. Mahantesh and Mr. Nagesh have always supported me and encouraged my talent. Samrthanam has become my family. Today whatever I am is all because of Samarthanam. Nobody is strong.. Nobody is weak.. It's all in the way you see and perceive it. Concentrating on what we lack, only gives us pain.. But when you are busy concentrating on what is in hand and what can be done next, you don't get time to see what you lack, as you eventually get surrounded by what you want. Good luck.. Stay positive.. Keep rocking..
Any facts, figures or references stated here are made by the author & don't reflect the endorsement of iU at all times unless otherwise drafted by official staff at iU. This article was first published here on April 2013.